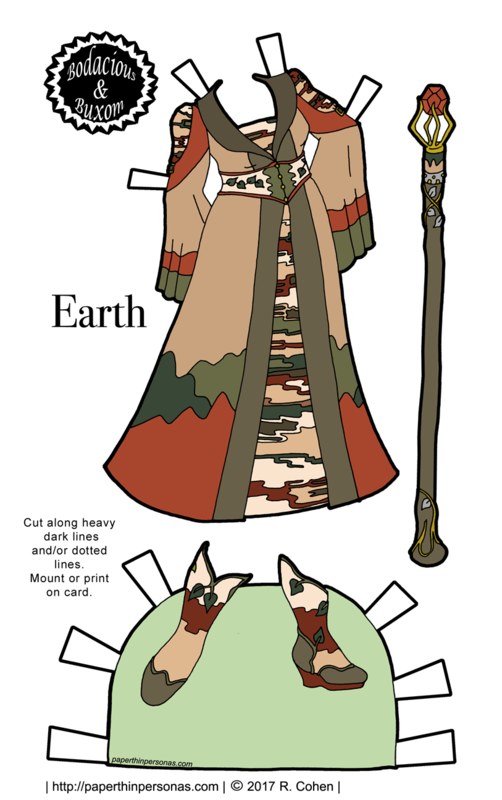 Today’s Printable Paper Doll Inspirations: Earth! Today’s B&B paper doll gown is part of the Sorceress Gowns Project in which I am drawing gowns for sorceresses (a fact that might be obvious from the name). The theme for this project was chosen by my Patrons. I’ve started the series with a doll and the four elements. This is the element Earth. I’ve also done Water and Fire. You can see all the Sorceress Gowns and Dolls under the Sorceress Gowns Project tag. Earth was a surprisingly easy dress to conceive of. I knew I wanted to focus on rocks rather than plant life. The pattern on her under-gown was inspired by the layers and veins in rocks. The bottom of her over gown is supposed to look like mountains. On her staff, I put a faceted crystal, because I wanted to capture more rock imagery. There is an Air gown forthcoming, of course, and then another Sorceress doll. After that, I’m not sure what I’ll do next. I do have an idea for an arctic/snow themed gown, so maybe I should do a desert/sand themed gown to counter balance it? Let me know what you think about that idea in a comment or what you think about today’s gown. Tomorrow there will be a new installment in the Fairy Tale and Nursery Rhyme series for the Poppets. Yey! Only wind left! Will there be a BW pdf of this? Oh, the stick is adorable! Yes, there was a problem with the file upload. You may need to clear your cache and refresh the page before trying again. Has been fixed. You may need to clear your cache and refresh the page before trying again. This is my favorite in the series! I love the colors. It looks like mountains, but also rock stratification. So cool! Seriously loving the little mini-series so far, can’t wait to see the next entries! I like the idea of the sand and ice gowns!